This past week, as Ms. Yellen relinquished her control over the Federal Reserve to Jerome Powell, the Fed stood by its position they intend to hike rates 3-more times in 2018. 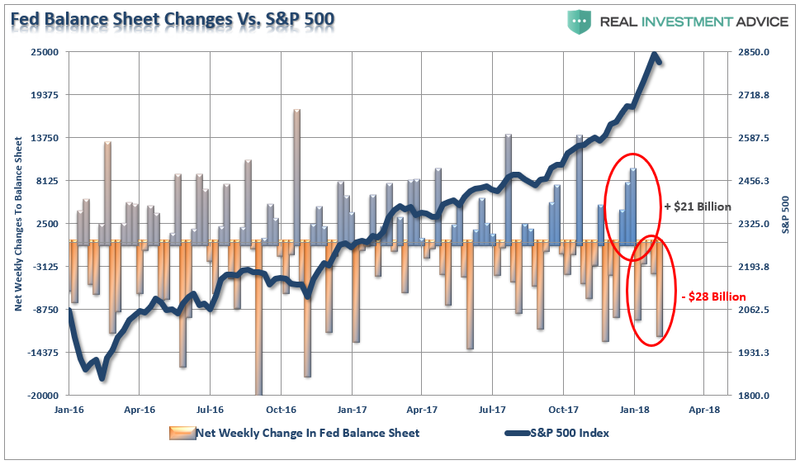 With the entirety of the financial ecosystem now more heavily levered than ever, due to the Fed’s profligate measures of suppressing interest rates and flooding the system with excessive levels of liquidity, the “instability of stability” is now the biggest risk. The Fed is highly dependent on this assumption. After more than 9-years of the most unprecedented monetary policy program in human history, they are now trying to extricate themselves from it. The Fed is dependent on “everyone acting rationally,” particularly as they try to reduce their balance sheet. The first attempt was seen in January. While the Fed did “reduce” their holding by $28 billion in January, it followed an increase of $21 billion in December. Which brings up several questions? Given the current tenuous political environment in Washington, D.C., not to mention the poisonous partisan divide between parties, there is a high probability next week could result in another potential “government shutdown” as funding is held up to extract political gain. Such could certainly roil the markets more. In such an environment, if the Fed continues their $30 billion balance sheet reduction program, they are “assuming” that “rational players” will step in to “buy” bonds keeping rates from spiking too quickly. The Fed most certainly understands the risks of sharply rising rates and the impact on the economy, and a bond market dislocation is “the weapon of mass destruction” they certainly want to avoid being launched. I highly suspect we will see the Fed re-engage in their ongoing “reinvestment” cycle to stabilize markets until an impasse is reached by legislators in Washington. But herein lies the risk. The Fed is very likely walking into a trap of their own making. With the recent spate of stronger economic data driven primarily by several natural disasters, the Fed is assuming that real, organic, economic growth is stronger than it is. While they point to macro-data points, like wages and employment, as a reason to lift interest rates to head off a potential overheating of the economy, the problem is when you break the data down to look at the real situation of the majority of Americans that drive the economy. “Despite a rampant rise in the markets, the recent spate of economic growth has been due to massive natural disasters across the lower third of the U.S. The impetus from those rebuilding efforts are now running their course and we are already seeing a weakness in the numbers. But wages are crushing it, and employment is booming? Here is the problem for the Fed. At the same time, the longer-end is spiking higher, which reduces demand for borrowing for CapEx, investment and longer-dated loans, like mortgages, which is already seen in declining loan demand. Add to this the reduction in liquidity support for the market, and you have all the ingredients for something to go horribly wrong. “But the risk to investors is NOT just a market decline of 40-50%.